I’ve been working on my daughter’s dress since March! I wanted to get it just right. I looked everywhere for just the right fabric and finally found it at an interior decorating place, but it was stretch velvet, which is impossible to sew. The slip was the hardest part. I put 15 yards of netting in there, but it just wasn’t big enough, so I bought some boning and it was strong enough to hold up this dress (it’s very heavy), so I bought a metal wreath that had 4 hoops in it. I took the loops apart. I cut some and pieced some and sewed them into the slip. I even had to make the gloves! I bought them, but they were way too big, so I had to alter them quite a bit and by the time I was finished, I wished I had just made them from scratch! I also made costumes for the rest of my family. My son is Prince Charming, I am the Fairy Godmother, and my husband is the Duke (with the shoe on the pillow). Wow! That’s beautiful! I’m sure your little girl will not only love it for Halloween but for as long as she fits in to it! I loved the idea! I love everything about it from top to bottom! You are a gifted artist! The idea of making something for the whole family was a great idea to. You are so awesome! That must have taken so long and it was very cool that you didn’t give up! You gave me hope so when I have a project I’ll remember you and how much time you spent and how incredible the out come was. You’re amazing! Incredible Job (again)! I have to tell you, I have been searching and searching on the web for something just like this with no success. Please tell me you would be interested in making one for me or maybe loaning/selling this one? 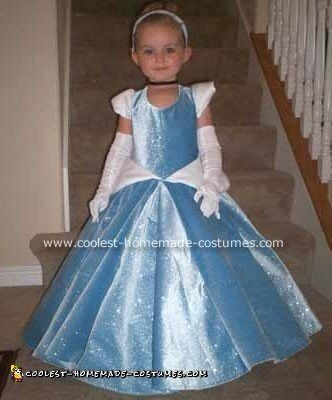 My daughter just turned four and would love nothing more than to be Cinderella. Oddly enough, I was hoping to outfit the family in the same theme just as you did with my 1 1/2 year old son as prince charming, of course! I am in complete admiration of your use of fabric and craftsmanship. absolutely best costume I’ve seen, you did a great job! Closest thing to the movie that I’ve found. Will you make a replica of this exact dress for me? Looking to fit a 3T. If you want to sell the duke and fairy godmother costume I would love to see those pics and buy or rent those from you as well. Going to Disney in couple of weeks, and would love to have for Halloween as well. Let me know…you are extremely talented and did a GREAT job! What would you charge to make one for my little princess? I just happened to be searching the internet and realized that this dress I made for my daughter is posted on this site. I had no idea. I remember entering the contest years ago, but didn’t know the picture and explanation were posted. I feel bad for not ever responding to all the wonderful feedback from everyone (that I didn’t even know about). I had no idea. Thanks so much for all your interest in this dress. It really was fun and I’ve had so many positive comments. It’s really worn now and desperately needs to be professionally cleaned. I probably will not be selling it and I’m not sure that I can make it again. The fabric was the best part about the whole thing and I’ve never seen it available anywhere. For the right price and with the right fabric, I could probably make a decent replica, but this first one will always be the most special and the best. that is amazing! Now I’m on the hunt for material to do my own. LOVE IT! Would you be willing to make another costume for my 2 year old? Where did you say the fabric? Please see my previous comment above. I don’t think I’ll be selling this dress and I haven’t seen the fabric available anywhere else since… even at the store I originally bought it from! I don’t think I’ve got it in me to make another one, but honestly, I’m not a master seamstress or anything. I just was determined to make this beautiful and I didn’t give up. If I can do it, you can do it too! Good luck everyone! And thanks again for all your kind compliments! The costume looks really good! Great job! I have something weird to say.. The little girl who is wearing the costume looks exactly like me when I was a child! It might sound dumb, but I have to think about it everyday because the similarity is unbelievable! Sorry for this weird comment!